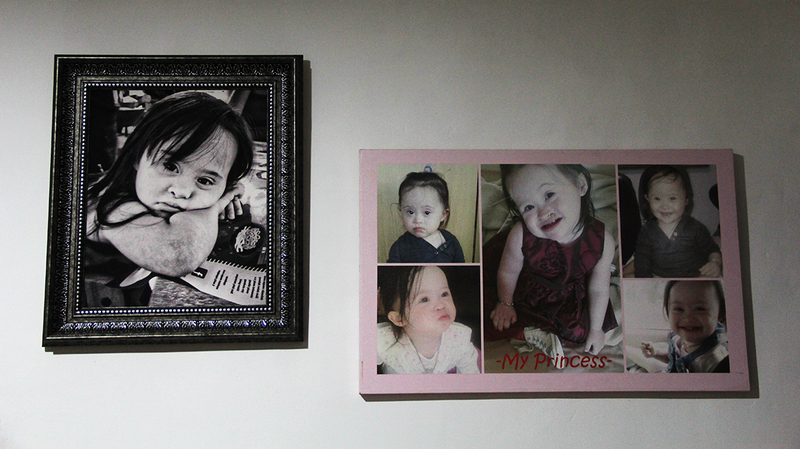 People with Down syndrome in Indonesia are often stigmatized by society and viewed as simple and incapable. Their struggle for social inclusion is only heightened by a lack support from the healthcare sector and Indonesian government. However, with the uncompromising love and support of her family, Evi Lugvianty, an eight year old Indonesian girl with Down syndrome, has been able to grow and learn just like any other Indonesian child her age. More astoundingly, Evi is self-taught and fluent in both Bahasa Indonesia and English. Meaghan Crooks explores Evi’s life and shows that when faced with stigma and adversity, nothing can bring Evi down. We had been sitting at the dining table for about thirty minutes talking about Evi. She was still at her therapy session but was due to arrive home at any minute. Although Evi was not at home, her presence in the house was strongly felt with large, framed photographs of her as a baby and a toddler scattered across the wall. Captions like “My Princess” made it clear to me that there was a lot of love for Evi in this house. Photos of Evi were displayed in the dining area. 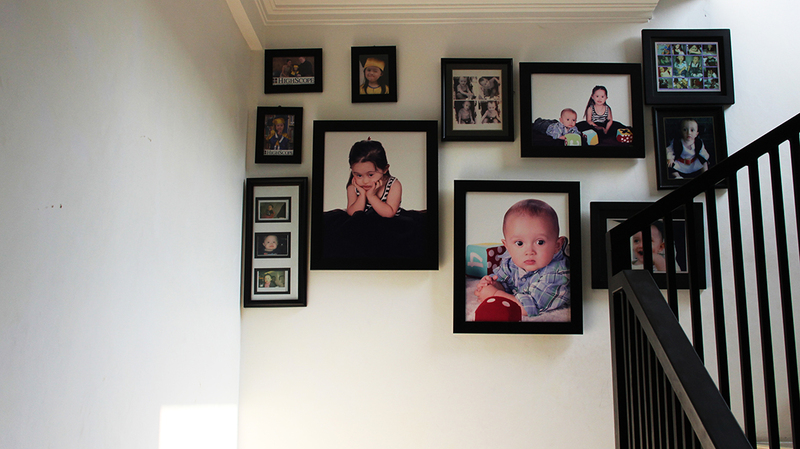 Photos of Evi and Adam displayed above the stairs. She arrived home after we had had a lengthy conversation with her mother, Vitri Lugvianty, who had warned us that when Evi entered a room, she became the star. Vitri was absolutely right. All attention turned to little Evi as she walked in, wide-eyed and smiling at the new and strange people in her house. “Evi, come meet my new friends, come say hello to my new friends” Vitri said as she introduced us. One by one, Evi silently took our hands and held them to her cheek, a gesture used by Indonesian children as a sign of respect to their elders. A moment later, she called out in perfect English. “Do you want to see my dolls? Do you want to see my backpacks? Do you want to see my clothes?” Evi’s excitement boiled over as she took us on a tour of her room. As an eight year old Indonesian girl, Evi attends Mutiara Harapan Islamic School and like many girls her age, she adores the colour pink. Fluent in two languages, Evi can speak, read and write in Bahasa Indonesia and English. This might come as a surprise to some, especially in Indonesia, because, unlike many girls her age, Evi also has Down syndrome (DS). Caused by a triplication of chromosome 21, Down syndrome is typically recognisable through people’s flattened facial features and upward slanting eyes. The disorder is usually accompanied by an impaired ability to learn and it is this intellectual disability which is the root of stigma surrounding DS in Indonesia. About 300,000 people in Indonesia are reported to have DS but a lot of the Indonesians do not understand what Down syndrome is or how the disorder affects people. The Indonesian public often view people with Down syndrome as retarded or idiots. According to Ariyani Saida, Vice Chairman of the Persatuan Orang Tua Anak Dengan Down Syndrome (Parents Association of Children with Down Syndrome, POTADS), the public’s perception of people with DS is improving but it is up to families to accept their children with DS before society will accept them. “Awareness or consciousness from the public towards Down syndrome kids and people has changed” Ms Saida said. “Society doesn’t think that people are gifted with the Down syndrome disability as a punishment or karma for the parents and family because Down syndrome is purely different genetics and they can grow like other normal kids” she said. That is exactly what Vitri and her family did for Evi. Vitri and Evi laughing with each other in their lounge room. At first, Vitri saw Evi’s DS as a punishment and a curse, she questioned God as well as herself and was embarrassed to tell anyone about her DS baby, even her father. “The first two weeks after the doctor told me ‘oh yeah, you have a Down syndrome baby’ I was just depressed” Vitri said. It was not until Evi was born that Vitri realised she was not cursed or punished, she just had a different path to travel in life. “Me and my husband realised that she was an angel, a blessing in disguise” she said. Neither Evi’s parents nor her disability have held her back in life. With no formal education, and against the predictions of her doctor, Evi picked up English and Bahasa from her parents at a young age. “At first the doctor said to use one or the other [languages] because it will confuse her but I never limit her capabilities” Vitri said. According to Dr Rhonda Faragher, senior lecturer and researcher on the education of children with Down syndrome at the University of Queensland (UQ), it is a significant benefit for anyone to learn a second language but this benefit is multiplied for people with DS. “We can think in different ways if we’ve got different languages that we can access and it’s quite a detriment for those of us who are monolingual, not to be able to think in different ways” Dr Faragher said. Listen to Dr Faragher describe how teaching a child with Down syndrome differs to teaching other children. It’s not just Evi’s parents which support her though, Evi’s extended family form a strong and critical support network. Vitri says her father, step mother and sisters all help to baby sit and care for Evi and, despite being younger, Evi’s brother, Adam, has been known to defend Evi at school when kids ridicule her DS. But family can only help so much, according to Dr Faragher, outside support can significantly help or hinder the development of people with DS. Alongside POTADS, which mainly supports children with DS and their parents, Indonesia also has Ikatan Sindroma Down Indonesia (Indonesian Down Syndrome Society, ISDI), which is more focused on supporting adults with DS. Whilst these support groups work tirelessly for the inclusion of DS people in society, according to Sri Handayani, Chairman of POTADS, the government and health sector still have a long way to go in terms of their support for people with DS. Undoubtedly though, one of the hardest challenges children with DS face, is getting a proper education. In accordance with Indonesian law, people with Down syndrome are entitled to the same education as any other child, but in reality it is not so easy to find a school willing to take a disabled child. Evi showed us her drawing skills as her younger brother, Adam, helped her. Whilst in many respects, Evi functions and behaves like other children her age, people were quick to judge her based on her disability. At the moment, Evi does go to a mainstream school but Vitri had to work very hard to enrol her there. “They thought, oh Down syndrome is automatically like below IQ of standard and that’s the main challenge” Vitri said. “I don’t want to her to go to a special needs school because she could do more than that” she said. According to Dr Faragher, not only is inclusive schooling important for DS learners but it is also an immense benefit to the other children in schools. Evi continues to attend Mutiara Harapan Islamic School and says when she grows up she wants to be a doctor. However, Vitri says that her family’s passion for singing and music has rubbed off on Evi so she wouldn’t be surprised if Evi pursues music in the future. Watch Evi as she makes a smoothie, plays with her toys and sings us a song. Music: Redhead by Jahzzar. “I think she hasn’t showed any interests in anything except like singing, art and musicals, she has a great interest in that. Ms Handayani says that, as well as more support from the Indonesian government, collaboration with other countries on research and policy would immensely improve the rights and opportunities of people with Down syndrome in Indonesia. Not all Indonesian children with DS have had the support and love that Evi has received from her family and she is quite lucky in this respect. There is no doubt that Evi’s whole family and especially Vitri will continue to fight for Evi’s right to education and equal opportunities.